Mind Collected allows you to configure several options related to its behavior, global hotkey, image preferences and database. To open the Options window, click the Options button in the main toolbar of the main window. “When minimized, hide to notification area (system tray)”: Mind Collected can be automatically hiden into a small icon in the notification area (right upon the system clock in the screen corner) whenever you minimize it, such as by clicking the minimize button or pressing the Escape (Esc) key. “Start Mind Collected on Windows startup”: Optionally, Mind Collected can be started with Windows. This is recommended, so you can quickly activate it when you want to view your items or input something new. It can be started “Minimized“. “Easy item shortcut launching (double-click)” – by default, this option is enabled. When enabled, double-clicking any of your items that has a shortcut specified will launch the shortcut. When disabled, double-clicking such item will open its Edit Item window like for other items. The default global hotkey is Ctrl + F2. The global hotkey allows you to quickly display or hide Mind Collected (if it’s running). The global hotkey can be quite time-saving and convenient, and is highly recommended. If you start using the hotkey, it will be easier and faster for you to get and input information into Mind Collected, thus gaining more benefit from it. “Maximum resolution of stored images”: When you add or edit an item, if its picture size exceeds the maximum resolution, it will be resized down (aspect ratio is preserved). That way, enormous pictures will not needlessly take up space in your database file. The default value is the resolution of your primary screen when you first started Mind Collected. “JPEG quality of stored images”: If you set lower JPEG quality, the database file size growth will be slower, as the stored images will occupy less space (this won’t apply to already stored images). Values above 90% are usually fully sufficient in quality, especially if most of your images are photos. Allows you to specify where to put database backups created using the Backup Database button in the main toolbar. This section displays the full path to the currently opened database file. It also allows you to Relocate your database file, to Open another one, or to create a New one. More info about these features can be found in the Database chapter. Mind Collected allows you to switch it into “full-screen mode”. 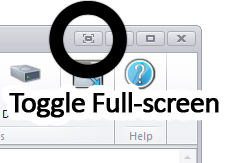 This will maximize the main window, and make the main toolbar auto-collapsible and thus occupy less space. Minimizing Mind Collected will disable the full screen mode. The keyboard hotkey for toggling full-screen mode is F11.